Settlers Creek Townhomes located in Keystone Colorado is a great option for those looking for more space than what a condo might offer in Keystone CO Real Estate. Built between 2000 and 2007, Settlers Creek Townhomes range in size from 2 – 4 bedroom residences. There are 66 residences comprised of 24 – 2 bedrooms, 32 – 3 bedrooms and 10 – 4 bedrooms. 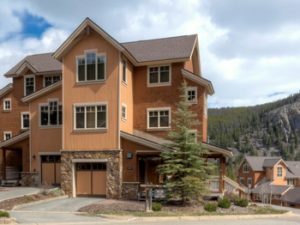 Tucked into the woods makes these townhomes very private but just a couple mile drive to the Keystone Ski Resort. Settlers Creek Townhomes in Keystone CO are located on the bus route which will take you to the Keystone Ski Resort if you don’t want to drive. Minnie’s Cabin offers owners and guests a year round outdoor pool and hot tubs. Within steps of any of the residences at Settlers Creek Townhomes you can find hiking, biking and snowshoe trails. If you are looking for privacy yet accessability to all that Keystone and Summit County have to offer, Settlers Creek Townhomes may be just what you are looking for.